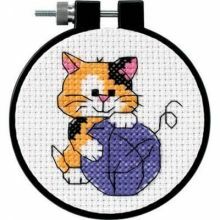 Cross stitch kit featuring a dog and cat, and the sentiment "Life is better with friends". Learn-A-Craft kits are geared toward young children. These kits are perfect for older beginners who want to learn the craft yet have a finished project with a more grown-up theme. Projects come with everything you need including the frame, which can be used to display your project when finished. Kit includes.. Learn basic embroidery stitches as you create the fun and funky Bird by Dimensions. Designed with the hand-drawn look of colored chalk on a chalkboard, the step-by-step instructions make it so easy! Stitch and finish in the included hoop. Finished size: 3" diameter. Embroidery kit includes: • Cotton thread • Printed black fabric • 3" plastic hoop • Needle • Easy instructions.. This picture is designed for children over 8 years. Each kit contains 11-count 100% Cotton White Aida fabric, 6-strand Cotton, needle, chart and instructions..
A dolphin that glows in the dark--this fun and easy design will tickle any child's fancy! Design is printed with glow-in-the-dark ink on white sailcloth and includes the hoop. Gold Petites - Gold Collection - Cross Stitch. Designed By Dimensions.. Create this happy duck while you learn to do counted cross stitch. Easy instructions take you from sorting the thread colors to mounting the stitched design in the hoop that is included. Bright thread colors worked in Cross Stitch on 11 count white Aida bring this cutie to life! Kit contains cotton embroidery thread, 11 count white Aida fabric, 3" (8cm) round plastic hoop for stitching and finishi..